The challenges facing China’s Silk Road strategy — and how to overcome them. In 2014, “one belt and one road” (OBOR), a reference to the Silk Road Economic Belt and the 21st Century Maritime Silk Road, were the keywords for Chinese diplomacy. The OBOR strategy has become China’s major foreign policy goal, Beijing will promote this initiative economically, politically, militarily and culturally over the next eight to ten years. In Chinese academia, it’s often said that 2013 marked the conception of the OBOR idea, while 2014 saw its operationalization. In 2015, the main task will be fully implementing OBOR. In 2014, preparations for the OBOR strategy made remarkable progress. Politically, China made use of the Conference on Interaction and Confidence-Building Measures in Asia (CICA) and a dual-track approach; economically, Beijing advanced several economic corridors and upgraded the China-ASEAN free zone, as well as the Asia-Pacific free trade zone. All these examples hint that China is undergoing a strategic foreign policy transformation — that is the policy of “keeping a low profile” is fading, as it cannot fully reflect the new government’s diplomatic ambitions. 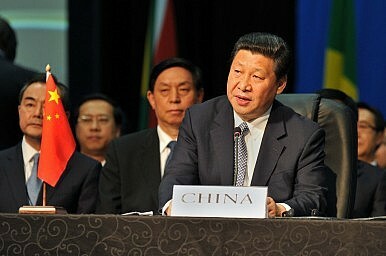 Being “proactive and enterprising,” in the words of Zhao Kejin and Yan Xuetong, is Beijing’s new diplomatic approach. Neighborhood diplomacy has a significant role in this strategy and will probably become more important than the traditional diplomatic priority of China-U.S. relations. The success of this new OBOR strategy depends on three factors. First, how should China assess the United States’ “rebalance to Asia” – is it containment or hedging? Second, how can China gain recognition and cooperation from countries along the Belt and Road? Third, how can China avoid economic and political risks as much as possible? How to assess the U.S. “rebalance to Asia”? Washington launched its rebalance strategy because of China’s rise. In the same way, Beijing put forward the OBOR initiative partly in response to the negative impacts of the U.S. Asia-Pacific rebalance. As a result, how China assesses the rebalance will have a large impact on Beijing’s reaction and countermeasures. If the strategy was introduced to contain China, then Beijing has to confront it by establishing and enlarging alliances as well as exploring quasi-allies and partnerships with friendly countries. In that way, China can expand its political clout and dilute U.S. influence in China’s periphery. But the strategy may not be targeted at containing China. Instead, perhaps the rebalance aims to deliver a message: that the U.S. has the capability to confront China, but won’t do so except as a last resort. Instead, the U.S. hopes that China will pursue its national interests in an internationally accepted way and play a bigger role in international affairs. In short, such a rebalance is a hedging strategy that has the dual aims of both engagement and deterrence. In this case, there is considerable overlap between U.S. and Chinese strategic goals and simultaneous competition and cooperation will become the new normal. Many people have argued that the U.S. is in fact trying to contain China. The general argument is that Washington is attempting to westernize China ideologically and politically; strengthen alliances and support China’s rivals; prevent the sale of advanced technology and arms to China; push China to adopt a market economy; and promote cultural infiltration through exchanges and training. However, of all the above points, only “westernizing China ideologically and politically” fits the mold of containment. The other factors are better explained as a hedging strategy. And the U.S. is pragmatic enough to realize that, having had so much trouble dealing with Iraq and Afghanistan, it’s not capable of “westernizing China.” Indeed, the U.S. isn’t seeking to westernize China; instead Obama’s rebalance to Asia fits with the traditional Anglo-Saxon strategy for foreign policy. The main driving force of the British Empire’s global expansion was the pursuit of commercial interests. Creating a balance of power and fostering regional stability could help to realize commercial goals; hence these became the core of the British Empire’s strategy. That entailed helping the weaker side in order to promote a regional balance of power and preventing the rise of a regional power or at least reducing its impact on British security and interests. Britain put these practices to use in its continental policy for hundreds of years. After World War II, the superpower U.S. adopted the idea of balancing in its regional strategies: for instance, supporting Western Europe’s confrontation with the Soviet Union and its Eastern European allies; supporting Pakistan against India in South Asia; confronting communist countries through a series of bilateral alliance in East Asia. At present, Washington favors Japan in the East China Sea disputes and other claimants in the South China Sea disputes in order to balance out China’s rise. In the post-Cold War era, the biggest challenge for the U.S. is a rapidly rising China. During the Clinton administration, Washington had a clear hedging strategy toward Beijing — that is, both engagement and deterrence. At that time, China lacked the capability to challenge the U.S. Thus, Washington highlighted engagement in order to involve China in the international political and economic system. After the global financial crisis in 2008, China has increasingly played a significant role in world politics and economics; thus the U.S. started to adjust its China policy. Since China does not accept the idea of a “G2,” the Obama administration began to emphasize deterrence. Washington launched the “pivot to Asia,” later rebranded the “rebalance to Asia.” At the same time, it put forward the idea of an “Indo-Asia-Pacific” to woo South Asian countries while balancing China. It is worth noting that the U.S. has not given up on engaging with China. How to resolve the distrust of neighboring countries? Recently, China has tried to establish all kinds of international mechanisms with itself in a leadership role. Beijing has also emphasized great power relations and continued to advocate a non-aligned policy while taking aggressive steps in its maritime disputes. Thus, the surrounding countries are concerned that China’s pursuit of its own national interests could harm its neighbors. Because of this fear, many countries have adopted a dual strategy of relying on China economically and relying on the U.S. for security. A successful implementation of the OBOR initiative will help to gain real understanding and support from countries along the Silk Road routes, especially on the security front. This may be the biggest challenge of the entire OBOR strategy. To begin, China could build sub-regional multilateral security mechanisms in key areas, such as establishing a common fishing system in the South China Sea and carrying out joint patrols as well as bilateral and multilateral military exercises. Economically, China has advanced its OBOR strategy through investment and the joint construction of infrastructure, in order to share China’s economic growth with Silk Road countries. However, many small and medium-sized countries are worried that economic dependence on China will lead to a flood of Chinese immigrants as well as an increase in domestic corruption. It’s hard to find examples of this happening in previous cases of investment from developed countries, but still Beijing has to make an effort to address these concerns. There are other challenges as well. Some Silk Road countries are concerned about the negative effects large construction projects will have on the environment, while some small countries worry that large-scale investment will alter their traditional culture and way of life. The Chinese government is currently searching for solutions to these problems domestically, but the current situation requires China to also solve these problems as they apply to foreign investments. Although it will be very difficult to solve these problems, China has no choice. How to avoid political and economic risks? A rising country inevitably needs to establish its own political, security, economic, and cultural space. Historically, that space has been exclusive. Even today, the U.S. rebalance to Asia seeks to build exclusive security and economic mechanisms — strengthening bilateral alliances and quasi-alliances and launching the exclusive Trans-Pacific Partnership (TPP). China has acted differently. China welcomes U.S. engagement in regional mechanisms led by Beijing, such as the Free Trade Area of the Asia-Pacific and the Asian Infrastructure Investment Bank (AIIB). Compared to U.S. initiatives, China’s actions reveal more openness, inclusiveness, and even morality. Building its own regional space is a necessary step on China’s path to becoming a global power. Since China’s strengths lie in the economic sphere, the OBOR mainly focuses on economic cooperation. But frankly, revitalizing the economies of all the Silk Road countries is a task beyond any single state’s capability and responsibility. Hence, China should be cautious about the economic and political risks in implementing its strategy. Many analysts have argued that the main domestic driving force of the OBOR strategy is a need to reduce foreign exchange reserves and to transfer excess capacity. However, the three principles of foreign exchange reserves are security, liquidity, and profitability, with security as the most important. Considering that the investment environment in Silk Road countries is not as developed as the environment in Europe and the U.S., the return on investment is likely to be low. Some investments may even become bad debts. It’s a serious violation of the principles of foreign exchange reserves management to have these funds become bad debts. China needs to avoid this by all means. As for the question of excess capacity, let’s take the steel industry as an example. Even if the demand for steel from Silk Road countries equals the demand of China’s domestic railway consumption (itself an impressive figure), China still could not solve the problem of excess steel. In 2014, steel consumption for domestic railway construction totaled 21 million tons; the volume of excess steel reached 450 million tons. That massive discrepancy can’t be solved by transferring materials to other countries. In this case, shutting down the factories may be the only solution, even if it is painful. Additionally, it is also worth noting the political risks of the OBOR strategy. Many Silk Road countries suffer from political instability, serious corruption and/or the threat of terrorism. How to find political stable countries with economic potential that are willing to cooperate with China? This should be a major research question for the OBOR strategy. We can loosely categorize Silk Road countries into four groups: small and medium-sized countries; countries that have territorial disputes with China; countries that are sub-regional powers; and countries that could potentially act as “pivot states” (meaning they are reliable partners for China and reach a certain threshold of national power). Countries in this last group are the key to the OBOR strategy. This article has raised three questions (or risks) facing the OBOR strategy. However, any assessments or adjustments to China’s development strategy made in response to these questions should also be considered a necessary part of China’s overall rise. The OBOR strategy is a blueprint for China to become a comprehensive global power. The OBOR is in competition with the U.S. “rebalance to Asia.” This competition will test various aspects of China and the United States’ national capabilities. If China can properly implement the OBOR strategy, it is possible for Beijing to change “America’s” Asia-Pacific into “China’s neighborhood.” Conversely, if the OBOR fails, it will mean opportunities for the U.S. and trouble for China. The OBOR is China’s attempt to evolve from a regional power with global influence to a comprehensive global power. The strategy has been decided, but the details could determine success or failure. China is already relatively strong, but it must cautiously consider points of emphasis and its own capabilities in implementing this strategy. China does not want to become the finance ministry for Silk Road countries. Dr. Xue Li is Director of Department of International Strategy at the Institute of World Economics and Politics, Chinese Academy of Social Sciences. Xu Yanzhuo received her doctorate from Durham University (UK) in December 2014 and studies international responsibility, South China Sea disputes, and Chinese foreign policy.